January 18, 2019, 1:41 AM · The latest installation of Disney's Soarin' ride now has an official opening date. Oriental Land Co., the owner of the Tokyo Disney Resort, announced today that Soaring: Fantastic Flight will open at Tokyo DisneySea on July 23. 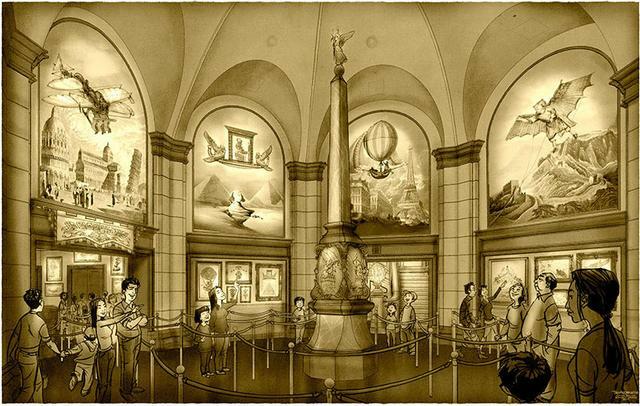 This installation will feature the "Soarin' Around the World" version now showing at Disney California Adventure, Epcot, and Shanghai Disneyland. But the Tokyo installation is getting a unique spin, one that ties it into Disney's Society of Explorers and Adventurers universe. The ride vehicles on DisneySea's Soaring will be old-timey "Dream Flyers" designed by SEA member Camellia Falco. This is the "C. Falco" first referenced in Disneyland's new The Tropical Hideaway restaurant, so huge props go to Theme Park Insider writer Ben Mills for calling this one. A grand tour of the museum includes a magical visit from the spirit of Camellia and culminates with Guests boarding her latest and greatest achievement—a flying vehicle of her own design called the Dream Flyer. Guests soon experience what Camellia believed, that our imagination can propel us into the future and take us everywhere in the world we wish to go. How well do you know Disney's secret society of theme park characters? I think this ride will be a major hit. The morning running of the Bulls to Toy Story Mania will switch to Soaring. Surprised took so long for Tokyo to get Soarin' but love how it's getting a special theme to it. Does this mean that the Tokyo Soarin’ is getting the Pandora treatment? By which I mean rather than pretending that you are actually going flying you are set up to enjoy a ‘dream flyer’ so the whole experience is presented as an ‘unreal’ one but by so doing actually making it more believable? If so then excellent! Enhancing the conceit of Soarin’ by playing to its unreality is genius. Wow, Tokyo really does spare no expense when it comes to the parks. In this case, they're paying for the "g" at the end of Soaring that the other parks couldn't afford.